Pond Boss Lighting Choose between a small LED landscape and fountain light or a set of 3 stone accent lights with photo-cell. The Pond Boss Landscape and Fountain Light is the perfect accent in or around your fountain. Equipped with a UL listed transformer, it is energy efficient and convenient with its automatic dusk-to-dawn sensor for a no-hassle experience. The single LED light has a low voltage of 0.5 watts so it stays cool. The light is designed with a weighted and pivoting base so you can easily position it in your water feature. This light comes with 4 colored lenses and looks elegant in water but is also easily hidden in landscape for a beautiful lighting effect. Safe for fish and plants. 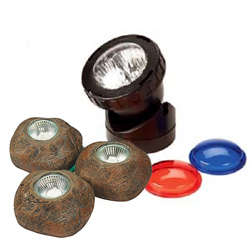 The Pond Boss Mini LED Landscape and Pond Lights are the perfect accent in or around your pond. Equipped with a UL listed transformer, they are energy efficient and convenient with its automatic dusk-to-dawn sensor for a no-hassle experience. The 6 LED lights have four feet of cord between each light. Each light has a weighted and pivoting base so you can easily position them in your water feature. The lights are low voltage, consisting of 0.16 watts per light, which allows them to stay cool. These lights look elegant in water but are also easily hidden in landscape for a beautiful lighting effect.